Several families of nontheraphosid tarantulas are known for building burrows that they densely line with silk and then close with a round or oval door made from many lay­ers of silk. The door may be hinged with silk at one side or at the center or held in place like a cork in a bottle. In either case, the tarantula tends to lurk just below the door, hold­ing it in place with spines on the front legs, or chelicerae. When it recognizes the tread of a prey insect or if the prey thumps on a line of silk that serves as an alarm, the spider moves very rapidly to open the door, move out of the hole, grab the prey, drop back into the hole, and close the door again. This can happen literally in the blink of an eye. Trapdoor spiders usually are found in dry, open, often rocky country, where large colonies of individuals may dig dozens of burrows in an area where the temperature, humidity, and soil conditions are just right. Often the entrance to the burrow is camouflaged by bits of twigs and gravel, and twigs may be glued onto the door with silk. Finding the burrow of a trapdoor spider can be virtually impossible until you spot one and you get an eye for seeing the others near it. Though many trapdoor spiders are small—less than an inch (2.5 cm)—a few common species may be from 1 to 2 inches (2.5 to5 cm) in body length. As a rule, trapdoor spiders have smooth, shiny bodies and legs with just a few hairs, not the dense bristling of bird-eating tarantulas. 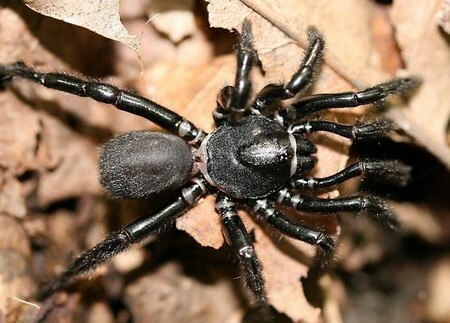 Most trapdoor spiders belong to the family Ctenizidae, which has several members in the southernUnited States, including Bothriocyrtum californicum, the Californian trap­door spider, which is common on hillsides in parts ofSouthern California. After rains, adult males sometimes leave their burrows to visit females and may be found strolling through backyards. A few uncommon species of Cycbcosmia, which have the tip of the abdomen flattened into a hardened plate with a complicated arrangement of grooves and circles, are found in ravines of the southeasternUnited StatesandMexico; they use the thickened abdominal plate to help plug die burrow. In the African Idiopidae, a pair of eyes is set on a separate tubercle in front of the other six eyes, giving these trapdoors their common name: front-eyed tarantulas. At least two species belonging to genus Mops are available to hobby­ists: one with blackish legs, and the other with glossy, reddish brown legs. 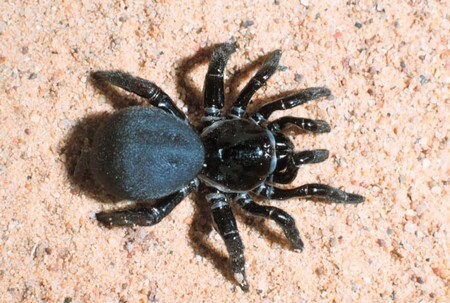 Also in the hobby are members of the family Nemesiidae (mostly unidentified species) from Africa, Chile, and possibly southern Europe; these tend to be funnel-web builders rather than true trapdoor burrowers, building tight, circular, nearly horizontal webs under rocks and other cover. Though they require deeper substrates into which they can burrow and more attention to the relative humidity near the bottom of the burrow, trapdoor spiders will do quite well in a terrarium with shallow substrate, just using a retreat cover and not trying to burrow, but this fails to give them the opportunity to show off their handiwork. Crickets and other insects are the major food.